United States Air Force Brig. Gen. Charles E. “Chuck” Yeager, retired, poses for photographers after returning from his 65th anniversary of breaking the sound barrier. AIR FORCE PHOTO. A new petition to the White House is asking President Obama to give retired Brig. Gen. Chuck Yeager his second star. Retired Master Sgt. Ronald Enriquez started the petition because he feels Yeager is due the honor for his decades of service to the Air Force. Reached through Facebook, Yeager says he appreciates the support from veterans and other folks for getting his second star. “I was raised to honor my flag and my country and that duty was paramount,” he said. The petition needs 100,000 signatures by Sept. 17 to get a response. As of Wednesday, it only had 78 signatures. A White House spokesman said every petition that gets the required number of signatures is reviewed and gets a response. “We’re generally not in a position to comment specific petitions until a response is issued to petitioners,” Matt Lehrich said in an email. 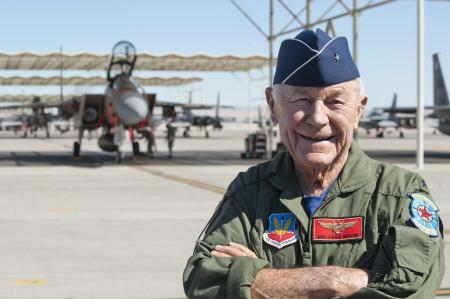 There is no way to tell you how dedicated and rare a person Chuck Yeager is. To push an aircraft to the maximum of it’s designed performance envelope, goes beyond the risk a fighter pilot endures. Pushing that aircraft to it’s point of failure, and then bring it back, takes incredible skill. His fantastic war record, combined with his test pilot days speaks for his qualifications for a second star. How many three star generals have risked as much, or have been as valuable an asset to his country. Duty, Honor, Country, Chuck has been loyal to all three and now it’s our Duty, and our Honor, to give back to that man for the sake of our Country! A person exceptional as Chuck Yeager does not come along very often. Mr. Yeager’s accomplishments are numerous, and verifiable. Many people owe their lives because of his daring and skill. I can think of no one who deserves a promotion more than a man who’s earned it. Quite frankly, Gen. Yeager has earned it in spades. Gen. Yeager didn’t seek fame and fortune, he only wanted to fly and serve our country as best he could. In my humble opinion Mr. Yeager will always be a hero. Maybe if the person who started the petition could write, it would have more than 78 signatures. It’s “personal gain,” not “personnel gain.” Going to sign. One more toward promoting this deserving man. So what exactly is the justification here? Chuck Yeager is a living legend and one of the most influential people on modern aviation, but it seems like a waste (particularly in today’s fiscally constrained environment) to put on such a dog-n-pony show. There are a lot of people that have selflessly sacrificed decades of their lives to the service of the nation and I am having a hard time understanding why Chuck Yeager should be treated any different. I don’t understand the need for this promotion. A few years ago, the governor of Alaska went out of his way to give high school diplomas to WWII veterans who had gone to war before graduating. These veterans had to be retired and in their eighties. Were they needing a diploma for some job application? I fail to see the need for this deed. The idea of “giving” out promotions because we like somebody is dumb. I suspect that if the petitioners who like him so much could hear the comments of those who encountered him at Edwards over the years following his retirement they might alter their opinion. So where do I sign the petition? I think he deserves the promotion. He took chances to help the AF that others did not take. I’m with you Bob. I witnessed Chucky boy being quite rude at the Beale clinic one day. And, they did get the quote right on the petition “…at no time in his career ever sought personnel gain in the military.” He only sought recognition for PERSONAL gain not for PERSONNEL gain… he didn’t care about his personnel. I would dread the days when he was on base… Grass Valley is too small and too close, glad I never ran into him there! Viperdude, there are many who have sacrificed which is why at 89 years old, General Yeager went to Afghanistan to support and thank the troops. Many of those people want Gen Yeager to get a second star. This is not a contest. Please go to http://www.chuckyeager.com and you will see some of his history. It’s very inspiring. Good Pilot? Yes. Great leader? Not so much. Should do your homework first. Great pilot. Great American hero. Outstanding leader. Read his book – shows his great leadership. And those of us who have actually worked for him, think so, too. I’d rather see all Medal of Honor winners promoted a grade or two upon award rather than Chuck Yeager promoted to Maj Gen in retirement. He did his job for God and Country…just like thousands of other military vets. I don’t know that going faster than the speed of sound the first time was any more harrowing nor pushed the aeronautical envelope any further than Yuri Gagarin (1st man in space), Alan Shepard (1st American in space) or Neil Armstrong (1st man to walk on the moon). He came down to talk to my ACSC class and I was not impressed by his actions as a leader. After the dinner several of us went up to talk to him and were totally blown off – we weren’t pilots. It seems that for Gen Yeager, only pilots rate; not my idea of a leader. I vote NO. Also, the aviation advances were made by the engineers that dreamt them up and designed the aircraft he flew. Courageous, yes; innovative, not so much. Coup de grâce, rank is not given as a reward for past performance but rather as an acknowledgement of future potential. I dare say, he’s tapped out. Sgt. Enriquez is way off base trying to promote this guy! And the majority of older Air Force members know it, as evidenced by the 99,642 signatures still required with 17 days to go to get a White House look-see. Good pilot? Yes. Gutsy pilot? Yes. Self serving? Yes. Good leader? Absolutely not! The stuff I’ve seen him do to the young female officers at the Edwards O’Club would be called sexual harassment today. He’d be losing a star, not gaining one. Yeager is one randy dog. General Yeager does have the Congressional Silver Medal of Honor. Historians are clear: the Wright Bros first flight and Gen Yeager’s historic flight past the sound barrier are the two real advancements in flight. Also, he was more than a double fighter ace in World War II. So many positive things he has done. Absolutely not. General Yeager was promoted and decorated based on his performance. I’ve been a pilot for thirty years and spent nine years on active duty and I NEVER heard anybody say anything good about him. Quite the opposite.